The ‘3rd African Islamic Finance Summit’ inaugurated by Mr. Ali Hassan Mwinyi, retired President of Republic of Tanzania, in Dar-es-Salam-Tanzania today, the delegate from different african countries participated in said summit . The theme of the two days summit is to explore the untapped potential of Islamic Finance market of Africa and to adopt the latest trends, address the challenges and discover the new opportunities in Islamic Finance industry of Africa. The summit s kicked off with key note speak of H.E. 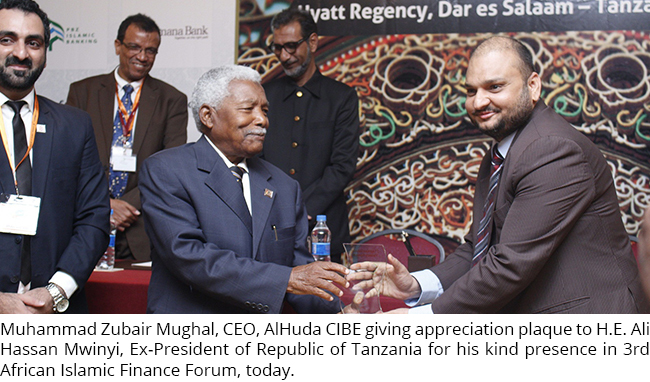 Ali Hassan Mwinyi, Retired President of Republic of Tanzania, he opened his speech by expressing gratitude to AlHuda CIBE for its effort to promote Islamic Banking in Tanzania and rest of Africa. He mentioned that Islamic Banking and Finance is good solution for Banking and Financial needs. Among the other dignitaries, H.E. Zakaria Anshar, Ambassador of Indonesia, H.E. Abuzied Shamseldin Ahmed Ambassador of Sudan, H.E. Amir Muhammad Khan Ambassador of Pakistan, H.E. Abdulmonem Annan, Head of Mission, Syrin and H.E Jasem Alnajem , Ambassador of Kuwait, also welcome Islamic Banking and Finance in African Region. Addressing the conference, speakers from Pakistan, UAE and various parts of Africa like Nigeria, Somaliland, Kenya, Zanzibar and Tanzania covered a variety of topics including challenges and perspectives of Islamic Banking in African countries, Shariah Challenges, Liquidity management issue, Islamic Microfinance, Takaful and investment opportunities in Islamic Banking industry Many prominent speakers including Dr. Muhsin Salim Masoud, Managing Director of Amana Bank Limited in Tanzania, discussed in detail the success and challenges of the first fully fledged Islamic Bank in Tanzania. Haji Omar Hussain Omar, the Chief Executive Officer of Takaful Insurance of Africa, in Somaliland asserted the investment opportunities on Islamic Banking and Takaful in Africa. 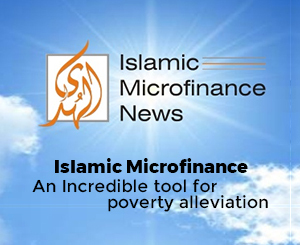 Abdallah Y Tego, the Dean of the Faculty of Business Administration in the Muslim University Of Morogoro, in his remarks, shared his views on the challenges and potentials of Islamic Microfinance sector in Tanzania. Mr. Azeem Iqbal Pirani, the CEO of Tanzania’s first Takaful Company, spoke about Innovative Products and a global look at Takaful. Mr. Mohamed Issa Hemed, the Deputy Secretary General of Muslim Scholars Organization in Tanzania, talked about the challenges in moving towards the new destination. Mr. Said Mohamed Said, the Director of Islamic Banking Division - The People’s Bank Of Zanzibar Limited, shared his views about PBZ Islamic Bank services. Mr. Sulayman Hamdun, Principal, Al-Maktoum College of Engineering and Technology, Mr. Yassir Salim Awadh, the Head Of Islamic Banking - National Bank Of Commerce Ltd, Mr. Abdul Nasir, M.D of Zanzibar Insurance Corporation -Zanzibar, Mr. Uzairu Abdul Athumani, the Head of Islamic Banking-KCB, Dr. Abdulrahman J. Nkoba, the Lecturer in Institute of Finance Management (IFM), Dr. Bill Kiwia, Lecturer in IFM, Mr. Ali Aboudi, the Vice President of Chamber of Commerce, Prof. Mustafa A. A. Roshash the Vice Chancellor of Zanzibar University, Abuzied Shamseldin Ahmed, the Ambassador of Sudan Embassy and Mr. Muhsin Hussain, Founder Director of Tanzania Takaful were amongst the intellectual and assiduous speakers of the conference. Addressing the audience, the organizer of 3rd African Islamic Finance Summit Mr. Muhammad Zubair Mughal, Chief Executive Officer, AlHuda CIBE - UAE echoed his thoughts, saying that Islamic Banking and Takaful is pertinent to the needs of the region and many economics problems can be solved through different products of Islamic Finance. He said that Islamic Finance is fastest growing area in African countries, Islamic Finance is not only developing its roots in Muslim countries but many non-Muslim countries are getting benefit from it. Alhuda Centre of Islamic Banking and Economics (CIBE) is committed to providing specialized Training, Advisory and Research globally with commitment, dedication, and aspiration in Africa. Keeping the above vision in mind, Alhuda CIBE with its vibrant staff has been working with full dedication since 2006 for strengthening Islamic Financial System. he also added that AlHuda CIBE already have its footprints in Tanzania, Somaliland, Uganda, South Africa & Nigeria but in next six month they will unlock two new countries of Africa for their services.